Hello! I'm here to give you the virtual tour of my classroom as a part of the amazing Teacher Week Blog Hoppin' event. Here is my pride and joy- my classroom library. I love love love children's books and in fact have a very hard time saying no to a book sale. Books are organized into baskets by genre or author. I also have the Accelerated Reading level on the spine of each book to help my kiddos find a "just right book". This side of my classroom stores word work materials, book boxes, literacy supplies, take home books, and guided reading materials. 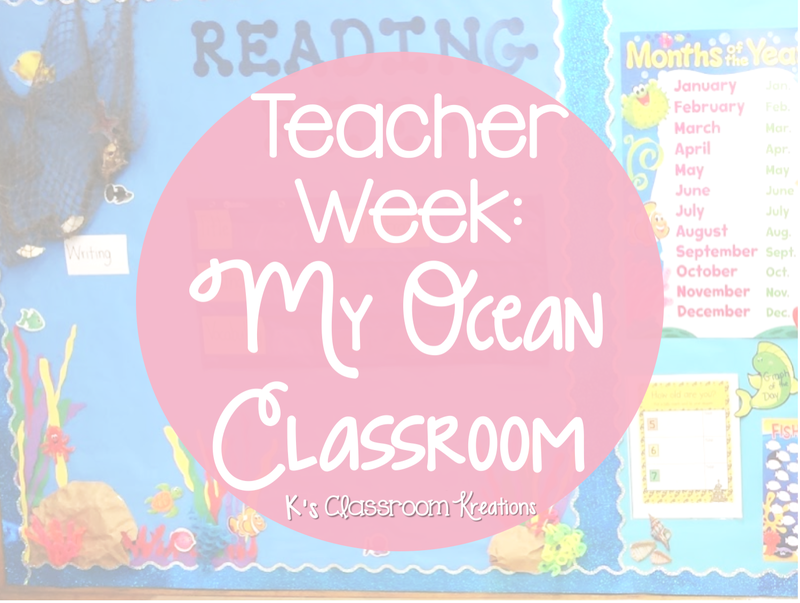 I also have a sensory box with a theme for the month (this month's theme is beach). The yellow board will be turned into a writing display. 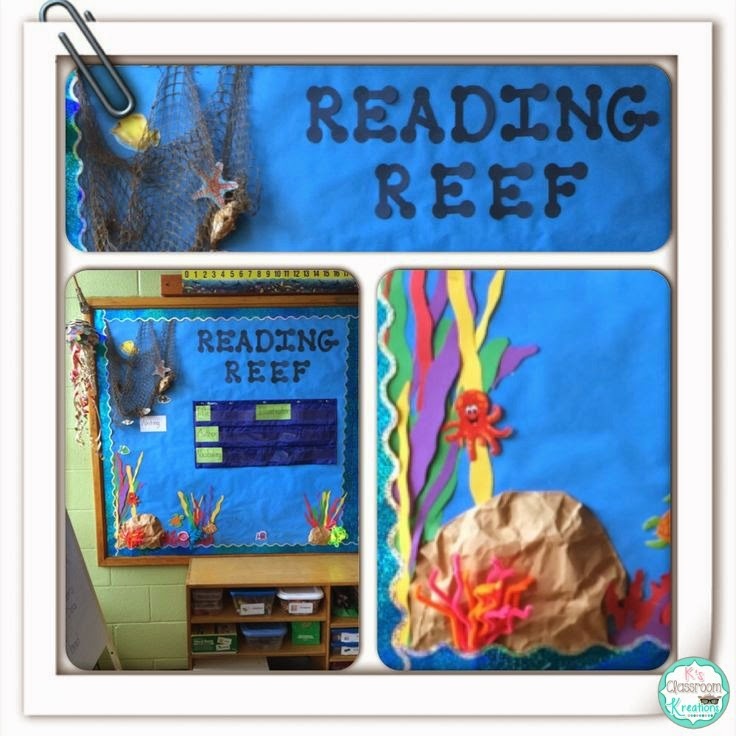 My 3D Reading Reef focus wall is one of my favorite Pinterest inspired ideas. I have used the Reading Reef board in the past but this year added the pipecleaner seaweed. I just use sentence strips to change out our story each week and staple up laminated Common Core standards. My writing center is one of my favorite places in my classroom. I like to store an inspiration station (wood pieces, napkin books, stickers, colored pens, etc.). Here is my math area with focus wall and materials ("Catch of the Week"). I have different colored baskets for each of my groups and drawers to store centers based on standard. I also love to label everything! You may notice that the desks are not in traditional clusters. Knowing the special needs of some of my students in advance has helped me give space to the little guys I know will need it. We spend the majority of our day on the carpet, in small groups, and working around the room so desks basically just hold materials. Here are a few other pictures from around my room (some areas are still under construction). Thank you so much for stopping by to see my room! Keep on blog hoppin' by clicking the pic below. Don't forget to stop by for Organization tips Wednesday (I looooooove to organize and can't wait to share someideas!). 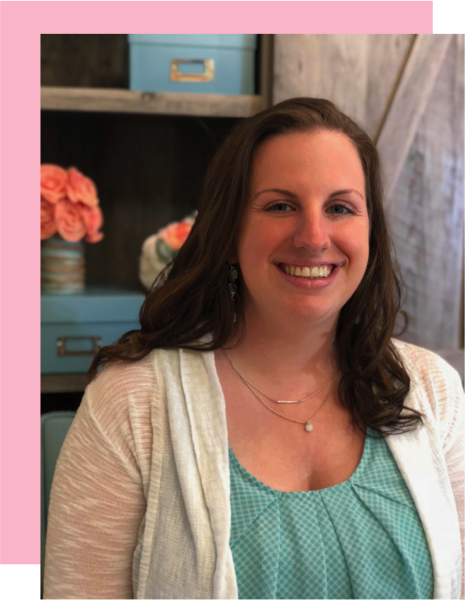 Hi I’m Kayla, a forever first grade teacher with a passion for adding purposeful play into my classroom. I believe that standards based learning can be cute, fun, and engaging without breaking the bank. I can’t wait to share ideas with you! Signup for first grade ideas, teacher tips, and ways to add purposeful play to your classroom. You have successfully joined our subscriber list. I can't wait to share first grade ideas with you. If you do not see an email from me soon, check your spam folder and let know by emailing me directly at ksclassroomkreations@gmail.com.